Jason L. Seward, Founder & CEO of Millennium Momentum Foundation, Inc. accepts the Henry Reining Outstanding Organization Award, from the American Society of Public Administration (ASPA) Board Member Iris Baxter, at the Annual ASAP Recognition Ceremony. Each Quarter, Millennium Momentum Foundation, Inc. highlights a significant accomplishment of the organization, as we continue to press forward to deliver the blueprint to reach, educate, and professionally develop those young people seeking to enter, or advance within, the field of public policy and other public service related fields. The American Society for Public Administration (ASPA), a very distinguished national public service membership organization headquartered in Washington, DC. that promotes and advances the highest standards of public service excellence, bestowed its prestigious 2007 Henry Reining Outstanding Organization Award at the ASPA Annual Awards & Installation Dinner on Thursday, May 3, 2007 at 6:00pm at the New Otani Hotel, 120 S. Los Angeles, CA 90012. 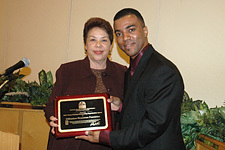 Millennium Momentum Foundation, Inc. was selected from among community-based organizations throughout the Nation due to the organization's ongoing efforts to create consistent educational and professional opportunities for students and young adults by providing them with knowledge and skills that are needed, but not commonly available to them in their diverse communities. This announcement brings a major victory home to Southern California as we build on our past, and embark on a steadfast journey to continue to "open doors today, for the leaders of tomorrow"!